It's here! My new couch was finally delivered on Friday afternoon and I am in love. It brightens up the space so much. It's amazing that once I got rid of the mushroom brown sofa it made the room exactly what I had always wanted. 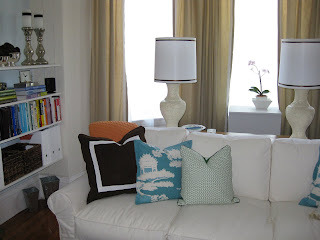 I'm playing with all the throw pillows I have collected to find the right combo, not 100% sure what mix I love. Sure there will be something I want to change about the room tomorrow, like a new table for behind the couch, but for today, I love it. I really like how that looks. Love your bookshelves too. How exciting!! Love the couch and pillows! Oh how nice to have a new couch to come home to. 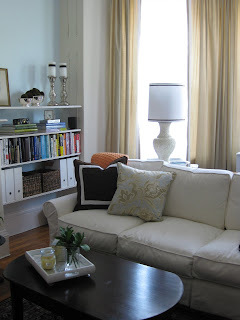 We have an old couch that really has been well loved - You inspire me to look for a new one to light up the space! It looks great! I know you are so excited. Always fun to get something "new"! Oh I love it! It looks fantastic! I know you are so happy. I have a very similar one from Restoration Hardware and I love it! I had the same reaction we got ours; it brightens up a room so much! I told my hubby I was done messing with the living room when we got it...yeah, that didn't last long. It looks fantastic! Your living room is so cute. Your apartment is SO SO cute! What area do you live in? I LOVE your curtains. It's so bright. We are renting a garden level...I hope it doesn't feel like a prison. Thank you everyone for such sweet comments- I am very happy with it. It looks so fresh and pretty. Love your lamps and shades too. Enjoy lounging! 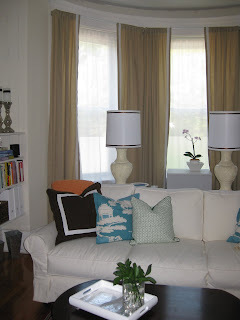 I love the sofa, the pillows, and the lamps are fabulous!